Yesterday, I promised to reveal a secret about the oranges, the Doodlewash dinner painting that I posted earlier this week. Here it is: I didn’t paint it! My daughter painted it in oils in her senior year of high school during a 30-minute painting exercise. She had a great teacher the first three years of high school, but during her senior (final) year, not so much. The instructor did a great job of teaching the mechanics, but she was quite demoralizing, and highly critical of her students’ work. This affected my daughter’s choice of major in college, and it took her an extra year to find her way back to art and design. All of my friends here give such generous feedback, and I wanted her to have a chance to see those comments on one of her paintings. I did not want you to be swayed in any way by knowing it was her work. So, I want to thank you most sincerely for your enthusiastic support. She very much appreciated all of your comments, as do I. I also want to thank the truly great teaching professionals out there. There are so many of you who give so generously of your time and talent, putting your heart and soul into the classroom every day. The value of a good teacher can not IMO be overestimated! My question for you on this painting (4×6″ on cotton stretched, wrapped canvas) is: Should I paint over it? I feel like I beat it to death. It started out as one thing and became something else, which is usually a good sign, in my experience. However, I think I should have stopped a long time before I actually did. Your thoughts and constructive criticism are most welcome! Thanks and have a wonderful weekend! LL what an awesome painting your daughter did! boy – you’ve got to be so very proud!! woohoo! and no, I don’t think painting over your painting would be the route I’d suggest. I like it! Thanks Debi, on both counts! I’m really proud of her, yes. I hope she’ll start painting again. Thanks for the tip on this painting too! (((((3d))))) I hope you have a great weekend! I seriously loved the painting. so she has skill ++ It irritates me to no end, when I hear about teachers who belittle … those in their care. I like the bright colors of the painting. After reading Debi’s suggestion, I’m imagining it with a very pale yellow. I’m sure it would look great. And you must be very proud of your daughter. I really liked the “oranges” painting. Thanks, J, much appreciated. Yes, she rocks and I hope she starts painting again! Very much. Thanks, I’m still not sure if I won’t just molding paste over this or something but I appreciate your feedback and Debi’s too. I am so pleased to hear your daughter has found art again, and what a fab way to have boosted her confidence. I had three art teachers when I was young, two were OK,mt he other used to sit in a small cupboard drinking spirits! Gosh it was shocking, but I don’t think he could get away with that these days. My best teachers have been my old next door neighbour while I was growing up, and my dad, of course with the huge benefits of the Internet, I have learnt so much more, WP being so supportive and enlightening enables growth and enjoyment with many many great friends. It’s amazing how a few comments can affect us in positive and negative ways. It really is amazing and I don’t think we all realize what an impact we actually have! Thanks, Rebecca. This one she painted like eight years ago but I hope she will paint again. I really admire her talent! I think she may start painting again. I’m really happy about this. Will report back, if she does! 😀 Cobwebs-be-gone! Rebecca, would you paint over this one or keep it, or take Debi’s advice and add white to yellow and go over that yellow strip a bit? I’d love to get your feedback on this if you have a second. I think I would add some lights, if it were oils I would do a glaze over some parts, can you glaze acrylics? You can glaze, but I’ve never tried glazing with an opaque paint – other than Titan buff. Hmm, we shall see…..thanks for your help! I agree with Debi, Laura. Follow her suggestions and keep your art in your month of May portfolio. Thanks so much for sharing your surprise about your daughters art. I hope she will continue with her creative process. I too had teachers that were demoralizing. I know the effect it can have. You are a wonderful role model for your daughter. Fling the paint!! Thanks, Sharon! I will probably continue into June as well, so who knows what we’ll be flinging by that time! Hugs back! So much to say. First bravo to your TALENTED daughter. What a clever thing to do to encourage her amazing talent!! I hope it inspired her. And You ms rockstar artista – my fingers are crossed that you do not touch this masterpiece as I LOVE it. Oh how it popped off the page!! It is bold and brilliant and full of life. Another piece for your gallery. I would proudly hang it. Thank you so much, I so hope she starts painting again. She is awesome, and great with the camera as well, doubly blessed! You wouldn’t lighten the yellow, then? I was hoping sleeping on this one would somehow have me smiling at it in the AM lol but no dice. It didn’t occur to me. I would leave it as is but as you know I am not the expert. I really really really like it! Whatever makes you feel good. Ut I could truly see this hanging in a gallery! I like it…keep it for future reference and move on. When you look at the entire month it will show you something you don’t see now. That’s great, I hope she does! Thank you, Kerfe; wise words, maybe I will see something. Hopefully a lightbulb over my head. I’m loving that O’s and Mets are both doing well so far this season. Your work is inspiring. Always interesting. I would not paint over this piece. Exciting news about your daughter. Carmel, it’s so good to hear from you and thank you! That means a lot to me. I seek to inspire and entertain lol! 😀 I hope things are going well at your end and that with everything going on, you’re still making time for art. I would love to see more cows! I’ve wanted to paint cows ever since seeing yours. Ok, more true confessions hehe. WOW! The Orange painting is really good! I liked the use of the complimentary color blue for the background too. I feel her pain. I’ve had a few art teachers that told me drawing/sketching and painting weren’t for me and I stopped trying to do it for decades after jr. High. I hope she’s picked it up again and keeps on going and growing with it! The painting in question- To me it could be finished. It evokes feelings and emotions in me. That’s what art is. I’m sure it speaks to everyone differently. Art is subjective non? The bottom line is you and your feelings about it. If it doesn’t feel finished let it marinate a day or two then come back to it. See how you feel about then. 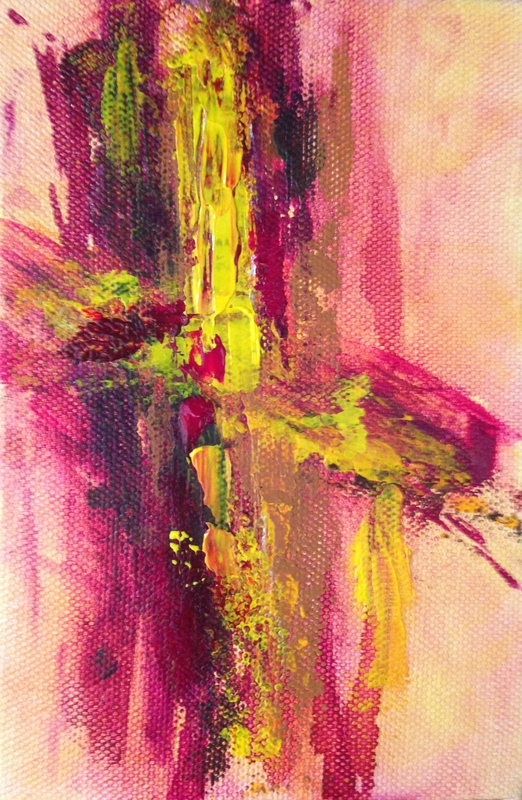 Thanks, Deborah and thanks so much for your encouraging words about her painting and mine too! I am sorry to hear that you had one of those teachers too. I hope you keep arting, Deborah, because you DO have talent and I think we all do, we are creators, but sometimes the teacher’s style may not translate. You GO and I am so glad you like both paintings. I will marinate on this latest one, and I appreciate your advice very much! Your painting has a lot of raw energy which the colors amplify nicely. It looks like a collision of like emotions coming from tangential directions, like a sudden blast of self-awareness that takes you off-guard and carries your life in a new direction. I like the raw yet controlled energy. I would keep this one.For me it is hard to get that feeling of spontaneous energy and aesthetics in color an form. Oh wow!! That’s awesome!! 😍Like mother like daughter! Fun that it didn’t seem like someone with totally different genes and we could believe it came from you! 😉Hehe She’s very talented! Does she want her name on the gallery I’m making of these? I think it could be strengthened, for sure, Jill. I have sooo much to learn about composition. I do enjoy playing with color. This one took a hard right turn somewhere along the line though lol. Thanks, Jill. I will let it stew for awhile; seems like the best policy at this point. I appreciate it. And the story about your daughter – the local high school here has an art and design teacher who has the same effect on his students – The ones who hang in there produce great work. My daughter was also discouraged from continuing and picked a completely different line. it sounds to me like this has been a great learning experience and I wonder what you will think of the painting if you see it in 5 years time – maybe this is watercolour thinking. I hope you have a restful day tomorrow (Sunday for me). Thanks, Stephen, I think that’s a wonderful and thoughtful observation. Yes, it seems to try to bubble up from the surface and I am going to trust that in time, it will. I really appreciate your wise words. Thank you. I hope you have a great Sunday as well! Hey and thank you for the follow as well! Your daughter’s painting was lovely – I remember it well! For this, I actually like as is. Rather than white, I’d bump up the lime green I see ~ it feels like the colors of an amazing floral to me. Thanks, C. The lime green must be a trick of the digital age, but the yellow probably has a bit of a greenish tint which may be skewing the colors a bit. I love your take on this as a floral. I meant to add a comment earlier when I liked your post, I was in the midst of painting fury! not the angry kind of fury but the busy as all get out kind. I hope that your daughter gets back into the swing of doing her art and even more tenacity that ever before. There are people out there that shouldn’t be giving their two cents of advice or opinions especially if they are projecting other than what they should be….like encouragement to name one. Your painting has sensitive feeling in the underpainting and then bam…..take this on the top, a bold statement of some kind. I love that! you can be bold and stand up! I am not tying it in with what happened with your daughter but what I see in how you painted it. A determination! there!…..see! lol I couldn’t help it but let you know in my staccato attempts to conveying how your painting comes across……don’t touch it unless you really have to and only if you have put it away for a while and not have your critical eye on board. Fine job, girl! I love your take, thank you Margaret. I really was in a “take that” place with this canvas, scratching in and beating it up occasionally so I could try and make it do what I wanted! But we know how well that sometimes works, even with a more accommodating dancer like acrylics. I’m really grateful for all the feedback and definitely going to wait on this one awhile before changing it at all. In fact, I turned it upside down last night before bed and kinda liked it in that incantation so one never knows! Thanks for your time and thoughts. I think the colour combination is great and a little unusual. The yellow just seems a little overpowering and over applied. Another option might be to scrape it off and at the same time giving the yellow a different textural form which would add an extra dimension to the painting. Thanks, Graham, I think that’s a terrific idea. I haven’t tried scraping off dry acrylic, but there’s always a first time! Thank you! Love the energy that sings in your brush strokes. As always your color choices are vibrant and full of life. Not knowing what your plans were with this painting, or the direction you wanted to go in, all I can offer, most humbly, is listen to your inner voice, do not be overly critical, and if you get to a point of uncertainty, put the painting to the side and come back to it another day with a fresh perspective. Thanks so much, Haunani. Those sound like wise words, for sure. I appreciate that very much! Ha, that’s brilliant – and I’m so glad your daughter has found her way back already! She’s clearly talented and if art is where her heart is, she should certainly follow it. There are too many frustrated artists who go into teaching without any of the requisite character for it, or who even think they are doing their students a favour by actively discouraging them from following their dreams. Let her know I am rooting for her and I’m sure we’d all love to see more of her work in future! I will do it, Iris and thank you! Much appreciated!